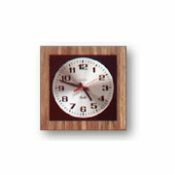 Contemporary light pecan or walnut colored woodgrain trim borders a black background with contrasting brass finished dial (8 inch). No lens. Sweep second hand on center dial.